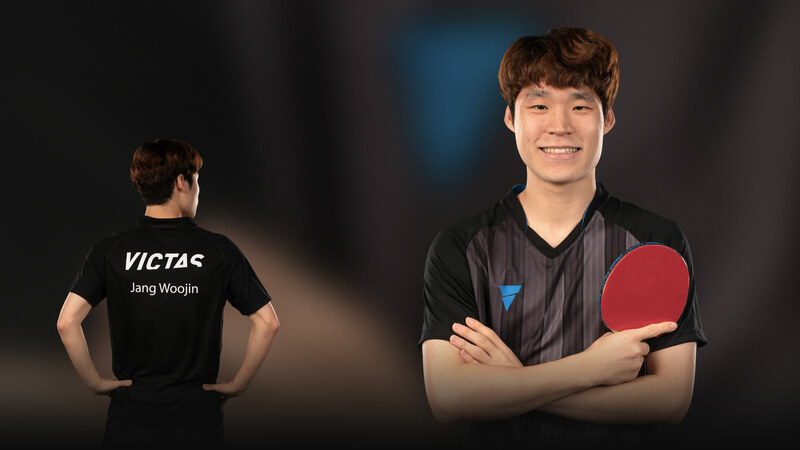 Jang Woojin is 23 years old, comes from South Korea and is currently ranked 11th in the world; he won the singles youth world championship in 2013, and has been under contract to Victas since 2018. That same year he won three Golds in the Korean Open 2018. He plays in the 1st team of TTF Liebherr Ochsenhausen and is a student at LMC – so as you see there is more than one reason for keeping Jang on your radar – we interviewed him to let you get to know him better. We asked him about his goals and his future and why you can’t find him on Facebook or Twitter. Jang, tell us why you love table tennis in three words. You have been to LMC before, in 2011 and 2012. Why did you come back again? I was 15 when I came to Ochsenhausen. Back then, it was my first time in Europe and a bit of an adventure for me. I felt very much at home in Ochsenhausen and I met a lot of super people and made friends. Even in those days, it was one of my goals to one day play for TTF. That’s why I was determined to give the club and Ochsenhausen something back and I’m glad that we won the cup for Ochsenhausen. What’s the big difference for you to training in Ochsenhausen and back home? In South Korea we often only have one coach and also only Korean players. In Ochsenhausen we have lots of very good coaches and also many players of different nationalities. So the training group is very varied and we have lots of different game systems for training. It’s no coincidence that I train longer and more often in Ochsenhausen than in South Korea. You have already been youth world champion, and were the first player to win all three titles at the 2018 Korean Open. What’s next on your list? My next goals include the singles world championship in Budapest – I hope to win a medal there. And it will soon be the 2020 Olympics – and I’m aiming for at least one medal in the singles and with my team. Where do you see yourself in five and 15 years’ time? In five years I’ll be at my peak table tennis age, so I hope to be among the Top 10 players and at the very top of the world class rankings. Phew, 15 years is a very long time (with a laugh). I hope that I’ll still be actively playing and can continue enjoy table tennis until the end of my career as a player. What do you do when you don’t happen to have a bat in your hand? I meet up with friends and enjoy singing karaoke! Otherwise, I watch sport – mainly table tennis, of course, but also baseball and football. Many of your colleagues use Instagram and Facebook to keep their fans up to date and communicate. Why can’t we find you in social media? Yes, a lot do that. But at the moment it’s not important to me. I prefer to focus on my sport and use my free time to relax and unwind. What personal and sporting qualities does he have that make him a fit for your brand? The question is rather which player could possibly be better suited to our brand and our “I am next” concept than Jang. His “incredible” Korean Open with three title wins shows what he has in him. Only very few players achieve this and it shows his winner mentality. He made it to the top of the world class in just one tournament. We also place great importance on having “good kids” in our team, so Jang is a fit all round and he think he sees it that way, too, from his side.